Road Warrior, Innocent Abroad and now singer of The Immigrant Song, A View of the Big World. The Esoteric Globe is like a cross between Pilot Guides and Seinfeld in blog form. It is a travel blog about nothing. Today FIFA is going to do the draw for the upcoming 2010 World Cup in South Africa. Its getting a lot of press here in England, as they have been identified as one of the top seeds. Not only are English fans wondering who the English team will play, but also where they will end up playing. There is a lot of hand wringing here about the transport in the country, as well as accommodation options. Some of the stadium are much smaller than others, and there are concerns about getting tickets. In general, though, most of the English fans seem quite excited about the prospect of seeing the English team in action during the World Cup. 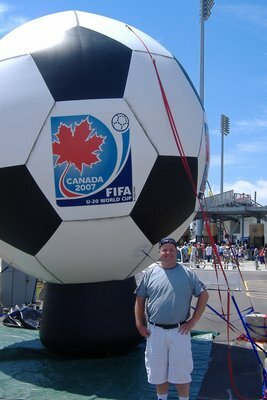 Back in 2007, I had my own World Cup moment when I got to see THE WORLD CUP FINAL! Now, sports fans will probably be wondering how I could watch a World Cup final in 2007, when the last World Cup was held in 2006 in Germany. I would have been a year late to watch the World Cup had I showed up in Berlin to watch it. I need to qualify the above statement. It was actually the Under-20 World Cup, played by the national under-20 squads. It is still a FIFA World Cup event, though, so it must count for something, right? The 2007 Under-20 World Cup was held in Canada. Canada isn't exactly known as a hotbed of football (aka soccer), at least at the adult level. A lot of the kids I grew up with all played soccer (including me), so the game was definitely popular for children. It just didn't really translate into an adult audience for the professional game, though. Toronto, and other Canadian cities, have had various incarnations of professional and semi-professional teams for years, but none really stuck with the public. That's not to say that folks weren't watching top flight football. The multicultural population of Toronto are big supporters of football. They just tend to watch the game from back in their mother countries, whether that be England, Scotland, Italy, Spain or France. As part of the deal of hosting the 1994 World Cup, the Americans set up a top-tier, national professional league. This helped grow the popularity of watching the game played in North America. 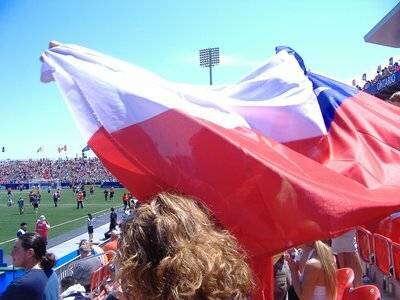 As part of a bid to get both the 2007 U-20 World Cup and a bring a professional Major League Soccer (MLS) team to Toronto, Canada built the football-only National Soccer Stadium in Toronto, known on non-FIFA days as BMO Field. 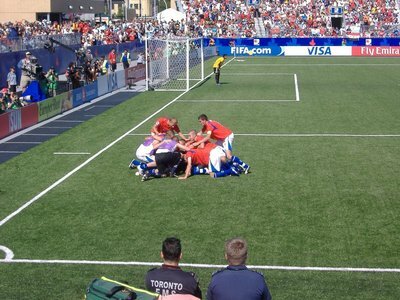 Canada won the hosting of the FIFA U-20 in 2007. Set up exactly like the big boys play their World Cup, the games are broken into group stages, with the top two teams from every group going into the elimination round. 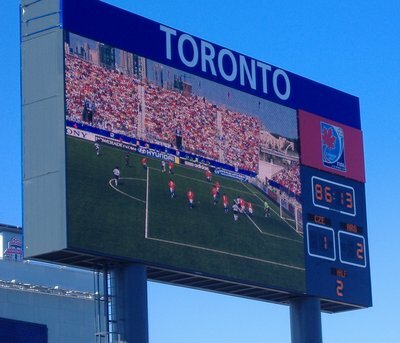 The games were held across Canada, with the final being held at the National Soccer Stadium in Toronto. At the start of the tourney, coverage was pretty quiet, but the hype surrounding the tourney grew as it progressed. The media started covering it more and more, and all the games ended up on Canadian TV across 4 different stations. Even though 2 of the stations were digital TV stations only and thus not available to most people, even without digital cable there were lots of games on regular TV. One Saturday night I was out at my local sports bar, and despite Toronto Blue Jays baseball and CFL (Canadian Football) being on, the U-20 was featured on the big-screen. The final two games were played on Sunday, July 22nd in Toronto. The games were Chile vs. Austria for third place and Argentina vs. Czech Republic for the first place trophy. Figuring that this is probably as close as Canada is ever going to get to hosting a World Cup, I wandered down to the stadium and picked up a ticket. 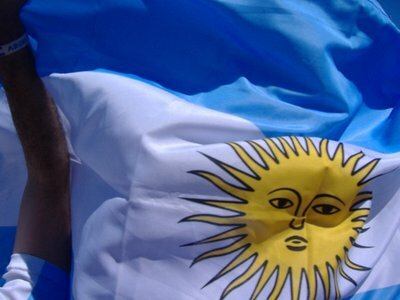 Unfortunately, there had been a bit of an incident after the Chile-Argentina semi final. After the game, all 21 players on the Chilean team were detained by police after the game. The players claim to have been kept from seeing the fans by the police, while the police claim that the players started brawling with the Police. The media coverage got a lot more intense after that. 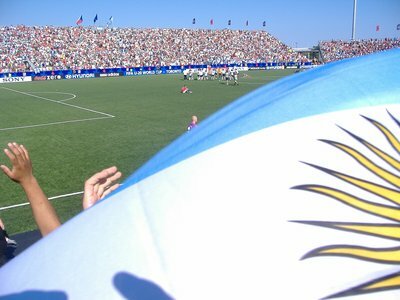 "There was an incident between the Chilean players and the police in front of the stadium, which is currently being investigated by all the parties involved. The 21 players were detained and later released," said John Schumacher, FIFA's spokesperson at the tournament. 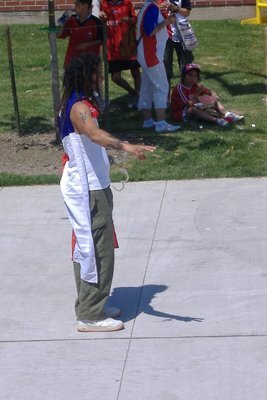 The Toronto Police called their actions "firm but fair" however the Chilean's called it police brutality. Many Chilean politicians were demanding apologies, and Canadian politicians are requesting investigations. There was some talk about perhaps the Chilean team not coming to play on Sunday in the third place game, but they announced they would come out to play. 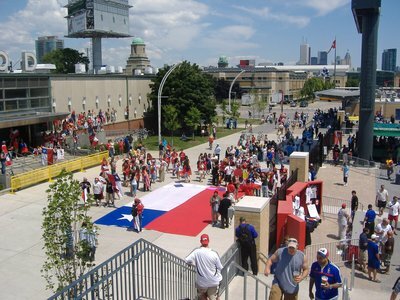 Upon arrival at the stadium, there was a large protest outside against the Toronto police by Chilean fans. Probably a good 75 to 100 people surrounding a large Chilean flags, many of them holding signs. The protest was peaceful, and the police kept their distance. The stadium was mostly filled with South American fans - Chileans for the first game, most of whom left and apparently gave their tickets to Argentinian fans for the second game. There were very few Austrian or Czech fans in the crowd, and they mostly got drowned out by the larger Latin American contingent. The Chileans had the best cheers - lots of variation. 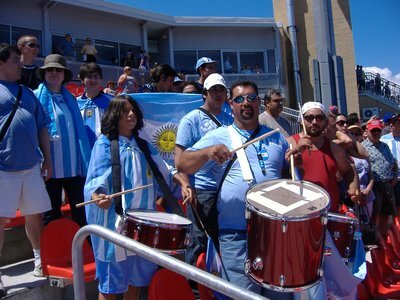 The Argentinians had most drummers, though. I missed the first 50 minutes of the third place game, so I missed the only goal. Chile scored, and ended up winning the game 1 to 0 to beat the Austrians and win the third place trophy. The Chilean fans had a scare near the end, but some fine goal keeping saw their goalie Cristopher Toselli (who set a tournament record by recording 492 minutes of scoreless action before letting in three goals in the Argentina-Chile match) knocking a ball out of the net just before it crossed the goal line as he was falling backwards. It was a spectacular save. In the second game, the Czechs scored first, but Argentina answered quickly and got another goal and went on to win 2 - 1. Argentina had the top scorer of the tournament, Sergio Aguero with six goals, won the golden boot for the top scorer, the golden ball as the MVP, was captain of the team so first to put his hands on the trophy and gets to wear the number 10! The Czechs score! Czech U20 team celebrates. Other than the Chile - Police dust up, the tournament was a great success. It established a new record for the highest total attendance in FIFA Under-20 World Cup history, finishing at 1,195,239. The previous record of 1,155,160 was set in Mexico 24 years previous. Including the final Sunday's two games, 31 of the tournament's 52 matches were sold out. As for the growth of soccer as a spectator sport in Canada, things are looking up. Toronto FC, the MLS team, is one of the most profitable and well-attended teams in the league, though that hasn't exactly translated into on-field success... yet. The MLS is looking north again. 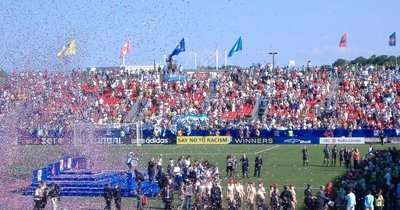 2011 sees Vancouver join the league with a professional team, and Montreal is highly favoured to join soon after. Canada is likely to get two MLS teams before Beckham even gets his first.